Get ready to hit the road for your hot springs adventure. Today’s drive is an easy one, just an hour and a half to the town of Banff. Banff National Park is considered to be the jewel in the crown of Canada's National Park system. Established in 1885, it is Canada's oldest National Park and one of the most visited parks in North America. We’re recommending only a short drive today – as far as Lake Louise. If you haven’t made advance reservations at the Lake Louise campground, plan to arrive by 11:00am to get your site and then head out exploring. If you enjoy taking photographs and getting up early, there's no place better to be than back at Lake Louise or Moraine Lake for the sunrise. Your journey today will have you skirting numerous lakes and passing through many small towns – offering a drive of beauty and culture. Continue south along Highway 31 to Ainsworth Hot Springs to sink into more soothing mineral waters. Head north on Highway 93/95 to Fairmont Hot Springs today. Fairmont’s year-round, crystal-clear hot spring pools beckon travellers into their steamy, mineral-rich waters. Your route today takes you through spectacular mountain scenery west of the continental divide and follows the valleys of the Vermilion and Kootenay rivers. Head south today on the Bow Valley Parkway, admiring the scenery as you leisurely take in the beauty. As your journey comes to an end, we have two suggestions for your return trip to Calgary, depending upon the time of year you are travelling. Get ready to hit the road for your hot springs adventure. Today’s drive is an easy one, just an hour and a half to the town of Banff. The main campground is operated by Parks Canada. As you may be arriving here towards evening, we’d recommend you make advance bookings for July and August arrivals. Plan to spend a minimum of two nights in Banff to take in the atmosphere and see everything the town has to offer. It’s nearly impossible to squeeze absolutely everything there is to do in Banff in just a couple of days. So be in the spirit of adventure and take in what you can. We recommend visiting the Cave and Basin Hot Springs and taking in Sulphur Mountain by riding the Banff Gondola. You’ll get sweeping panoramic views of the mountains and valleys. A truly stunning sight. Relax at Banff Upper Hot Springs, a rich-in-minerals outdoor swimming pool that is open year-round. See discounts available on the CanaDream app for many of these experiences and attractions. We’re recommending only a short drive today, less than an hour to the stunning Lake Louise. If you haven’t made advance reservations at the Lake Louise campground, plan to arrive by 11:00am to get your site then head out exploring. 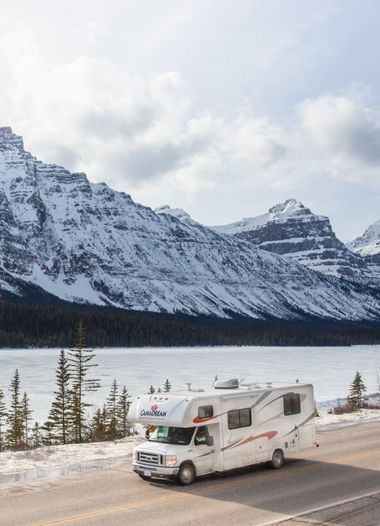 Instead of your first stop being in Lake Louise, we suggest you head at least part way up the Icefields Parkway. While you don’t have time on this tour to travel the complete length of the highway, travelling as far as Bow Summit will provide you with a taste of the scenery and wildlife in the area. Get a glimpse of Crowfoot Glacier, Bow Lake and visit the lookout to see the aqua blue waters of Peyto Lake. On arrival back at the Lake Louise village, take the short steep road up Lake Louise Drive to Chateau Lake Louise and the lake itself. And, on your way back down to Lake Louise Village, you’ll notice a road heading off to the right. This road will take you to Moraine Lake and the Valley of the Ten Peaks. As you hit the road for Revelstoke, you’ll continue west on the Trans Canada Highway crossing the Alberta/British Columbia border into Yoho National Park. If you’re travelling between June and the end of September, visit Takakkaw Falls, where a short hiking trail leads to the base of the magnificent Falls. Also along the way is Emerald Lake, the largest of Yoho’s 61 lakes and ponds. Continue along Highway 1 to Golden, a town situated at the confluence of the Kicking Horse and Columbia Rivers. Revelstoke is reached by crossing the Roger’s Pass, one of BC’s great mountain crossings. While today’s destination is officially Revelstoke, you may decide to end your day at Canyon Hot Springs and soak in one of the two natural mineral hot pools there. Set in the Columbia Mountains between Glacier and Mount Revelstoke National Parks, Canyon Hot Springs also has an excellent RV Park. From Canyon Hot Springs, it's a mere 25-minute drive into Revelstoke. Before leaving Revelstoke, take a walk through this alpine city to see some 60 restored period buildings and, if you’re a train enthusiast, stop in to visit the Revelstoke Railway Museum. Your journey today will have you skirting numerous lakes and passing through many small towns. Highway 23 crosses the water at Shelter Bay where you board a free ferry to Galena. More hot springs await on the other side of the lake at Halcyon and Nakusp. Halcyon Resort features four mineral-rich pools and plenty of adventure opportunities. New Denver and Silverton sit on the eastern shore of Slocan Lake, where you’ll find museums, artisan studios and plenty of outdoor activity options. Follow Highway 31A to Kaslo, where you’ll stay for the night. Continue south along Highway 31 to Ainsworth Hot Springs to sink into more soothing mineral waters. This unique hot spring has a horseshoe-shaped cave lined with stalagmites and stalactites. Explore the cave or relax in the main pool overlooking picturesque Kootenay Lake. Take Highway 93 to Fort Steele Heritage Town a restored Northwest Mounted Police Fort before heading north along Hwy 95A to Kimberley. This Bavarian themed community has a four-season alpine resort and is home to Canada’s largest free-standing cuckoo clock. Head north on Highway 93/95 to Fairmont Hot Springs today. Fairmont’s year-round, crystal-clear hot spring pools beckon travellers into their steamy, mineral-rich waters. The resort also offers golfing, skiing, hiking, biking, horseback riding and spa services. Continue on to Invermere and Windermere Lake, a great summer destination with various activities and things to do, including visiting nearby Panorama Mountain Village. Panorama is a four-season resort that offers many outdoor pursuits, including hiking, biking, rafting, golfing, skiing, heli-skiing, snowmobiling and more. .
Tonight’s destination is Radium Hot Springs, located in Kootenay National Park. This is one of the largest hot spring mineral pools in Canada. Soak away your day on the road while gazing up at the red cliffs of Sinclair Canyon. Keep watch for bighorn sheep, which have long been local residents of the community. Be sure to visit the CanaDream app to receive a discount off your admission or other activities you take in today. Your route today takes you over the Banff-Windermere Parkway (Highway 93) through Kootenay National Park. The road passes through spectacular mountain scenery west of the continental divide and follows the valleys of the Vermilion and Kootenay rivers. The Parkway meets Highway 1 at Castle Junction where you’ll take the overpass and join the Bow Valley Parkway heading south to Johnston Canyon. Walk across the road to Johnston Canyon and take a hike to the Lower and/or Upper Falls. This is Banff National Park’s most popular hiking destination. The path takes you into the depths of a canyon along catwalks and amongst spectacular waterfalls. If you’re still looking for something to do after hiking to the falls, consider a trip northbound on the Bow Valley Parkway (you’ll be doing the southbound trip tomorrow). The Bow Valley Parkway offers exciting opportunities for wildlife viewing and is a beautiful scenic drive. Overnight at Johnston Canyon Campground. If this campground is closed or full, the closest campground open will most likely be at Castle Mountain or in Banff (Tunnel Mountain). Check the Parks Canada website for more information. The road joins Highway 1 just west of Banff. If you didn’t visit Lake Minnewanka during your stay in Banff, take the turn-off to the Lake and follow the Minnewanka Loop trail. Stop at Cascade Ponds, a beautiful recreational area with picnic tables beside a large pond. From Minnewanka, the loop continues on to Two Jack Lake, a sheltered lake with facilities for picnickers. Further on, a road branching off the loop runs to Johnson Lake, another day-use area centered on a shallow lake ringed with trails. Return to Highway 1 and continue on until you reach the junction of this highway and Highway 40 into Kananaskis Country. South of the junction on Highway 40, you’ll come to an area called Canoe Meadows. This is a popular place for kayakers and white water rafting. If water adventure isn’t your thing, there are plenty of hikes and trails to enjoy in this gemstone area of Alberta. Don’t forget to check out your CanaDream app to scope out places to stay and discounts available. Advance reservations for camping are recommended, particularly during July and August. We have two suggestions for your return trip to Calgary, depending upon the time of year you are travelling. If you’re travelling between June 15 and December 15, you can take Highway 40 south through Peter Lougheed Provincial Park to Longview. Once at Longview, explore the area and search out the towns of Millarville (famous for its farmers market held on Saturdays throughout the Summer), Turner Valley (it was here, in 1914, that Canada’s first major crude-oil discovery was made) and Black Diamond. These towns are all part of Diamond Valley – the heart of the Cowboy Trail. Another option is to consider stopping at the Chiniki Cultural Centre, offering various interactive programs for a deeper understanding of the First Nations culture. There's also a great golf course in Bragg Creek if you've time to hit a few balls around. Or, visit Cochrane, located only 18km west of the Calgary city limits on Highway 1A.